Relax and enjoy a Big Bear vacation summer or winter at Big Bear Lake California. Located in Southern California, this mountain vacation spot is a popular destination all year around. Enjoy the lake in the summer, or the snow in the winter. It's hard not to have a good time at Big Bear. Your Big Bear vacation is located about 100 miles from Hollywood (Los Angeles and Orange County areas), and 145 miles from San Diego. No need to wait for snow to head to Big Bear to enjoy some great outdoor entertainment as Big Bear prides itself for being a phenomenal four-season community with more than a few fun things to do for all members of your family. Located about 100 miles northeast of Los Angeles and easily accessible from southern and central California, the ride up the mountain is amazing as Big Bear is surrounded by the San Bernardino National Forest. The lake sits at a pleasing elevation of 6754 feet and is surrounded by mountains that are great for hiking in the summer and skiing in the winter. What an amazing site! There is so much to do. Camping, hiking, mountain biking, horseback riding, fishing, and picnicking are popular in the long summer, while the snow in the winter allows for skiing, snowboarding, sledding and snowball fights. There are events and activities all year around, including music concerts, chili cookoff, paddlefest, film festival, tour de big bear and more. And if you are looking for a more relaxing pace to your weekend, I invite you to come out to the beautiful, picturesque Bear Lake. The sunsets are something out of a magazine and there are plenty of hiking trails along the waters’ edge. Take a walk down the pier and feed the ducks. There are so many fun things to do like stand-up paddleboarding, jet skiing, kayaking and parasailing to name a few. Go ahead, grab a pole, bait your hook and cast it out for that perfect catch of perhaps a nice size bass or a plump trout. You may even want to take advantage of one of the fishing guides offered through Big Bear fishing charters. Just visit www.bigbear.com/things-to-do/recreation/fishing-charters/. Looking to rent a pontoon boat, fishing equipment or maybe even a little waterskiing? Call ahead to Holloway’s Marina & RV Park 398 Edgemoor Road at 1-909-866-5706 or Pine Knot Marina located at 439 Pine Knot (just down from the Big Bear Funplex) at 1-909-866-7766 or Captain John’s Marina nestled within secluded Grout Bay at 1-909-866-6478. Let the fun begin! Dust off and hitch up those “two wheelers” of yours, and get out and ride the fabulous trails that await you at Big Bear! The locals may call it the bike path, and it really does not qualify as a hiking trail, but we beg to differ. The sign says it is 3.2 miles but we believe it to be a bit less. The ride/hike is quite comfortable. You will be crossing a couple of wooden bridges and going over a few streams that may or may not be have flowing water depending on drought conditions. Definitely bring your camera…you won’t be sorry. There is a picnic area when you reach Meadows Edge and the Serrano Campground. The ride is pretty comfortable but you will want to bring along a drink or attach a water bottle to your bike. Should you choose to hike this beautiful path, it is paved and completely stroller friendly for those with little ones in tow. I encourage you to stop off at the Discovery Center and take in all that it has to offer. That’s right! You can’t miss the sign in the parking lot at Bear Mountain Resort. Situated just a hop skip and a jump from the slopes is Big Bear Alpine Zoo, 43285 Goldmine Drive, Big Bear Lake, California. The winter schedule hours are Mon-Fri 10 a.m. to 4 p.m. /Sat & Sun 10 a.m. to 5 p.m. Summer Schedule begins in May for Memorial weekend and ends in September after Labor Day. In case you are wondering what kind of animals you will see, check out the beautiful Arctic Fox or the ever so magnificent Bald Eagle. There are also animals of the area such as the Barn Owls, Black Bears, Bobcats, Burrowing Owl, Canada Goose and the Chuckwalla. Let’s not forget the ever so busy American Badgers! Big Bear Village also has a vast array of things to do for all ages. Stop in at some of the fun shops and pick up your Big Bear souvenirs. There are also some wonderful restaurants to get a snack, lunch or dinner. We had breakfast at Boo Bear’s Den and so we can vouch for some delicious food and excellent service. We also had dinner at Peppercorn. The food was amazing. You will definitely want to call ahead for a reservation, as the wait can be a bit long. Again, something for everyone! Step inside for a fun round of bowling or make your way over to the pool tables and put down your quarters. You see, it is not just a bowling alley it is a complete fun center all in one. The Alley Oops Sports Bar is located inside the Bowling Barn and serves up some nice drinks. They also have darts, high definition televisions and video game arcades. Make it a barn night with your buds! Another great place to visit while in Big Bear is the new revamped Hot Shot Miniature Golf Course. With a new facelift and sporting a sign that says “Cosmic Golf” with new carpets, smoothed concrete as well as some awesome glow in the dark paint everyone will have fun late night golfing. It features the classic obstacles you would expect to see at a miniature golf course such as a castle, windmill and of course mountains and a loop. Hot Shot Miniature Golf is located at 42123 Big Bear Boulevard. Call ahead with any questions (909) 866-7333. Moving on to more outside fun. We will suggest the Alpine Slide at Magic Mountain Recreation Area. Snow or sun they are open year round. In the winter there is plenty of fun snow play and in the summer months there is an amazing water slide. The water slide has two twisting and turning flumes that land you in the heated pool awaiting you at the bottom. Let’s not forget the adjacent 18-hole miniature golf course with its fun water features and challenging greens. Oh, and did you see those fast and furious go-karts? They come equipped with 5.5 horsepower Honda motors for some rip, roaring fun. Parents can participate or plan a little R&R while watching from one of the two sundecks or the spacious lawn. The Alpine Slide at Magic Mountain is located at 800 Wildrose Lane, Big Bear Lake, CA 92315 and can be reached at (909) 866-4626. For more information visit their site at http://alpineslidebigbear.com/. What are you waiting for? Head to Big Bear Lake! Big Bear Lake skiing is popular in the winter months. 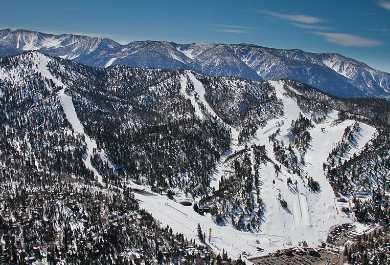 Big Bear ski resorts include Snow Summit, Bear Mountain Resort and Snow Valley. You can rent ski and snowboarding gear if needed. Try the Alpine Slide at Magic Mountain for a fun bobsled ride. It’s your choice, Snow Summit, Bear Mountain Resort or stop in at Snow Valley on your way up the mountain. If you are new to skiing you will most likely need to rent some gear. No worries! There are plenty of great places to rent but we definitely recommend Blauer Ski & Board. The staff was super friendly and offered great advice for the new boarders in our crew. Blauer Ski & Board is located conveniently along Bear Boulevard at 41177 Big Bear Blvd, Big Bear Lake, California. Call ahead with any questions you may have at (909) 866-5689. Before you start up the mountain don’t forget to get your Adventure Pass. It will be necessary for all off road parking and such. Just go to http://bigbearcountry.com/adventure-pass.html for details. You can stay at a vacation cabin, bed and breakfast, resort, or RV campground. 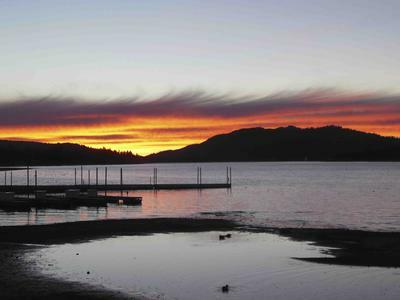 For a great experience, try camping in the Serrano campground just off Big Bear lake. The history of Big Bear began with the Serrano Indians occupying the mountainsides some 2,500+ years ago. It wasn’t until around about 1860, while hunting for bear that William Holcomb discovered gold. As you can imagine, a gold rush followed. Appropriately coined Bear Valley by Benjamin D. Wilson due to all the bears in the area. Yes, their ancestors live on and there are still bears on the mountain today. In 1884 Big Bear built its first dam and soon to follow was the first hotel in 1888 called Bear Valley Hotel. It mysteriously caught fire and burned to the ground Christmas Eve in 1900. It was a summer time operation and was known as somewhat of a monopoly on tourist trade. Sure to follow would be another resort, Pine Knot Lodge in the early 1900’s. As you can guess Big Bear became a favorite for many including Hollywood. 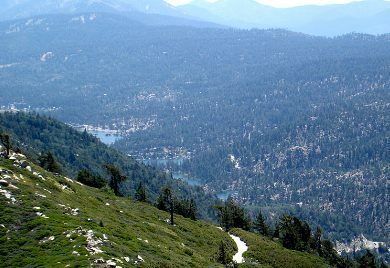 Big Bear’s beauty and private back lakes inspired many a film such as Elvis Presley’s “Kissing Cousins”, “Paint Your Wagon” and “Gone With the Wind” to name a few. Lynn Ski Lift was opened in 1938 and with the amazing lake and natural wonders it was considered the perfect mountain getaway. It was during the 50’s that visitors in the mountain realized that Big Bear was not just a summer vacationing spot but was a four-season resort.